Bambrella Side Wind Levante with Spuncrylic Cover: The Bambrella Side Wind is an innovative style of parasol that will enhance your outdoor entertaining. 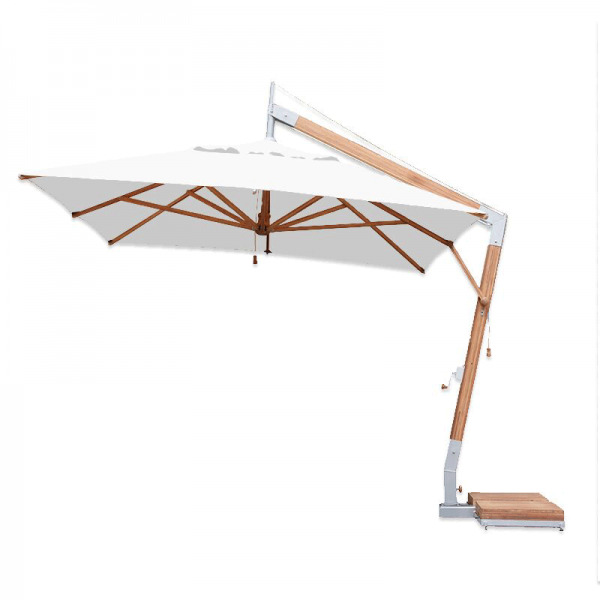 Made from laminated moso bamboo, this canopy will be strong, enduring and timeless. This parasol combines style and practicality and is available in three different shapes so you can opt for the traditional round parasol, or for the modern shaped square or rectangle. There’s no messing around with pulleys, simply turn the hand winch to open and close the parasol. The rope is stronger than steel so there’s no worry about any metal fatigue over time and other internal parts are made from as specialised polymer which won’t rust or seize up. The base is included and matches with a bamboo outer finish with a concrete centre, so you’ll be sure the parasol is weighted down and still looks good! Base: Concrete Centre with Laminated Moso Bamboo Finish- 2 x 70kg.